Pinay In Texas Cooking Corner: Thank you! 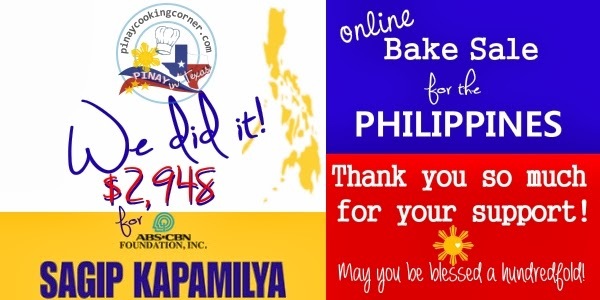 The Online Bake Sale for the Philippines was a huge success! Thanks to the kindness and generosity of those people who took the time and effort to join me in this fundraiser! It's truly amazing to see what people can do if they work together! Last Saturday, I've already finished sending out instruction emails to everyone, both bakers and bidders. As of today, almost all of the payments are in, and some of the goodies (including my Ground Coffee Chocolate Chip Cookies and Food for the Gods) are already shipped. Hopefully, by the end of the week, all donations will be paid and all the goodies will be on their way to the winning bidders! Whewww...the past two weeks was indeed exhausting, but very fulfilling for me, I tell yah! With your help, we beat our goal! Provided that all payments will be made, we will be able to direct a total of $2,948 (which is $448 over our goal of $2,500) to Sagip Kapamilya via ABS-CBN Foundation International. A MILLION THANKS to all the bakers, the bidders and everyone who supported us in this cause! Our fundraiser wouldn't have been successful without you! Every small contribution you made means a lot to me! Once again, THANK YOU for supporting me in this cause! I am truly grateful to all of you who have willingly extended LOVE and KINDNESS to my fellow Filipinos in a very short notice! You are all SO AMAZING! For those who would still like to make donations to help the victims of Typhoon Haiyan in the Philippines, please do so through ABS-CBN Foundation International. Every penny you donate will go to disaster relief and humanitarian assistance in the calamity-stricken areas, and will surely help affected families to rebuild their lives and communities to start sustainable rehabilitation programs. Wonderful news, Tina!! God bless you and your family! Thank you for being such a caring soul.